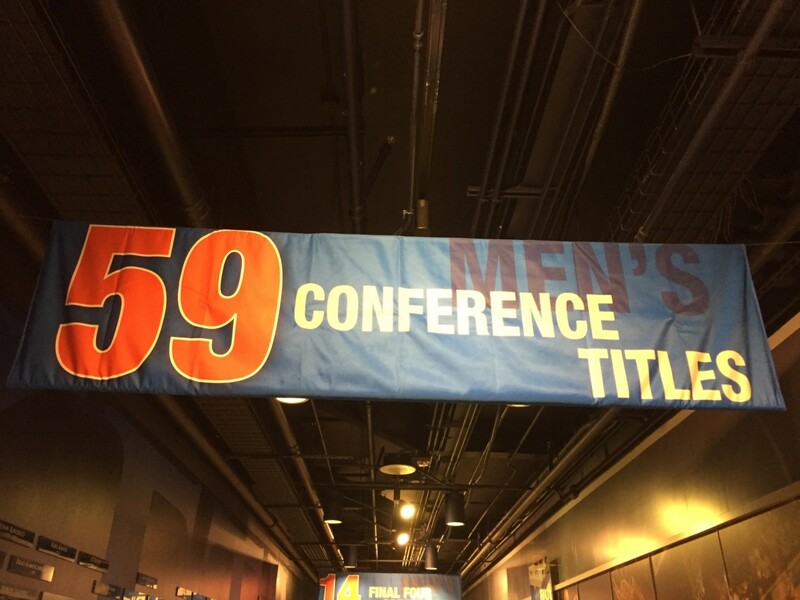 That number could grow to as many as nine by next season, but right now, I’d like to focus on “number six.” Last year Thomas Robinson was selected by the Sacramento Kings with the fifth overall pick. Robinson’s stint in California was short lived, as less than eight months later he was traded to Houston. Unfortunately, Robinson’s journey did not stop there. Robinson was again traded, this time back to the west coast as he joined the Portland Trail Blazers. 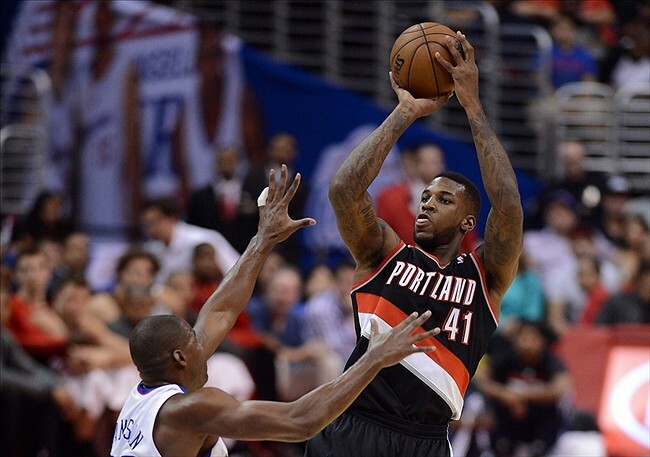 Thomas Robinson is a very versatile center, in that he can score, rebound, and defend. Whether the comparison is to a strong defender (Chandler, Mutumbo, Noah), to a scorer (Jamison, Boozer), or to someone who does a bit of everything (Haslem, Gasol), Robinson matches up quite well. Thomas Robinson may be overlooked as a potential breakout candidate, but the potential is certainly there. Regardless, Thomas Robinson does have a couple areas to improve. You might notice that there is one main category where Robinson performs at a significantly lower rate than the competition. This is the thing that is keeping Robinson from being a starting-caliber player: Player Efficiency Rating. What is Player Efficiency Rating? Player Efficiency Rating is a statistic that I recommend every basketball fan learns and embraces. Player Efficiency Rating, or PER, accounts for nearly every facet of a players being, weighing the positive statistics (made shots, assists, rebounds, blocks, etc.) against the negative ones (missed shots, turnovers, fouls, etc.). The formula then adjusts that number according to how many minutes the player gets per game, and then adjusts it again according to the average pace that his team plays at while he is on the floor. This number is calculated for every player in the league, with the league average always being weighted to equal 15 (to account for the variance in level of talent in the league from decade to decade). While PER is not a perfect system, there is no denying that it has been an extremely accurate predictor, specifically in the case of big-men. So what can Robinson do to improve his PER? Statistics say that Robinson will improve his PER simply by aging another year and continuing to mature. The transition to the NBA is difficult, and it certainly doesn’t help that Robinson has already changed scenery twice. If Robinson can find a role with the Blazers, and average 15-20 minutes a game (or more), his passing will improve and his turnovers should decrease. This will lead to a significant rise in his PER. Robinson’s below-average rating could be from a function of many different things, but ultimately only consistent minutes will be able to prove whether or not Thomas Robinson could be a legitimate NBA starter. Now if you were wondering why I chose the players that I did, the reason is quite simple. 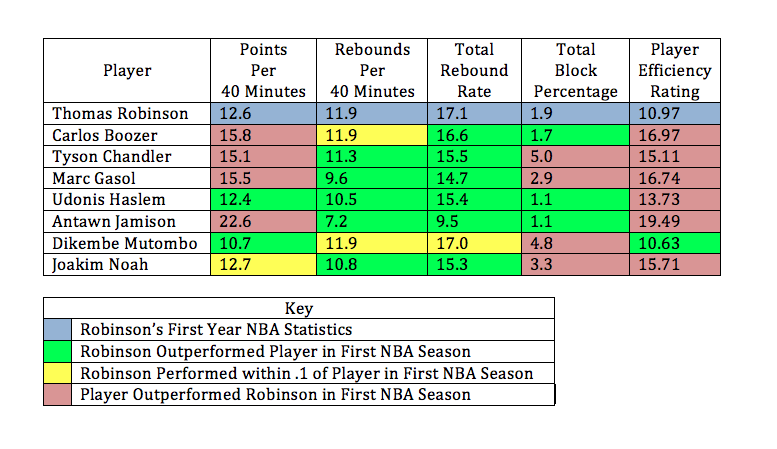 The five players listed below Thomas Robinson were the five leading rebounders in the NBA last season. Not only does Robinson’s rebound rate rank third among, but it also surpasses the group average of 16.9 and the group median of 16.8. Robinson’s rebounding compares favorably with these five players, which is impressive considering that these are the five BEST rebounders in the league (from last season): These aren’t your ‘run of the mill’ big-men. Robinson has a talent for snatching boards, which can make all the difference in a close game. Now let’s turn to the future. I’m not saying that Thomas Robinson is going to become the next Dwight Howard, but there are signs that point toward future success for the former Jayhawk standout. Ultimately, it will be up to Robinson to determine how good of an NBA player he becomes. One thing is for sure… Thomas Robinson will always be far above average in one category: heart.